Our machines can also be used for the very demanding jobs of floor remediation, decontamination and lead and asbestos removal – sanitation, in the full respect of norms and conditions assigned by local health and safety authorities. lead paint is now prohibited in a lot of developed countries. However, lead paint is still present in many old houses and old buildings. 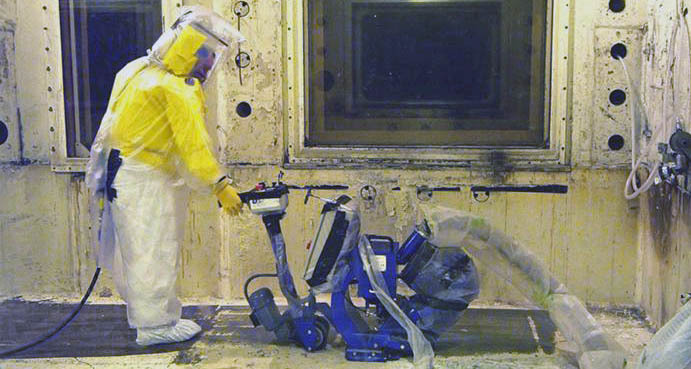 Nuclear decommissioning is the dismantling and decontamination of an old nuclear activity: power plant, laboratory, or industrial nuclear site that no longer requires measures for radiation protection. As a minimum, the floor, walls, and external structural surfaces within work areas should be cleaned of loose contamination.